MRIs – magnetic resonance imagers, useful in medicine. …the history of electromagnetism is one of unification. Over and over, different ideas about how things work were subsumed into the same theoretical framework…. Electromagnetism is an example of a field theory, the central object of study in theoretical physics. We don’t have a mechanical picture of what the field is, or why it is a certain way. It’s not like waves in the water or anything like that. It just exists, but we do have mathematical rules that describe how it works…. Michael Faraday investigated things like the way a wire carrying electric current deflects a compass needle. His crowning achievement was to discover that changing magnetic fields create electric fields, a phenomenon called induction. James Clerk Maxwell looked at all that, sat down with pen and papers, and mathematically described Faraday’s results in a complicated set of differential equations, importantly including the idea that changing electric fields would create magnetic fields, completing the symmetry between the two. When Maxwell finished his theory, he discovered that it allowed waves of electromagnetism to fly off at high speed – when he calculated the speed, it turned out to be the speed of light. Experiments with radio waves soon verified that light was nothing more than a special form of electricity and magnetism. What exactly is the relationship between electricity, magnetism, and light? We keep talking about the electromagnetic field. What exactly is a “field” anyways? How do understand what one is? See here: What are fields? 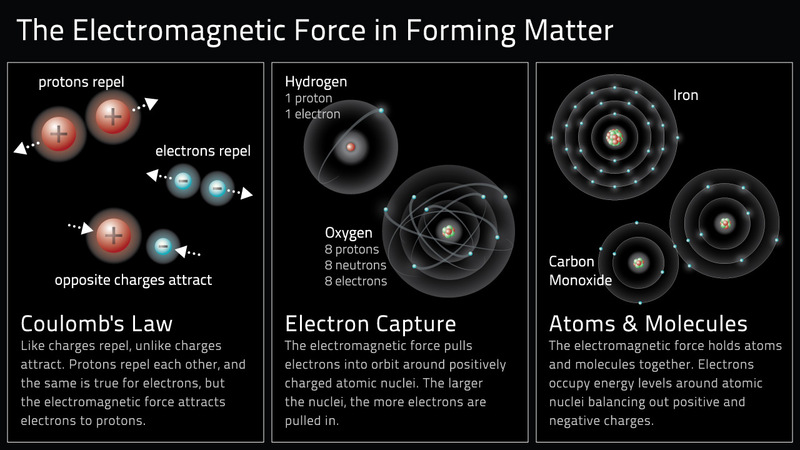 The electromagnetic force is the force of nature behind electric fields, magnetic fields, and light. It is one of the four fundamental forces in nature. ἤλεκτρον, ēlektron, “amber”, and μαγνῆτις λίθος magnētis lithos, which means “magnesian stone”, a type of iron ore. The electromagnetic force plays a major role in determining the internal properties of most objects encountered in daily life. Ordinary matter takes its form as a result of intermolecular forces between individual molecules in matter. Electrons are bound by electromagnetic wave mechanics into orbitals around atomic nuclei to form atoms, which are the building blocks of molecules. This in turn governs chemistry, which arise from interactions between the electrons of neighboring atoms. This in turn is determined by the interaction between electromagnetic force and the momentum of the electrons. The theoretical implications of electromagnetism, in particular the establishment of the speed of light based on properties of the “medium” of propagation, led to the development of special relativity by Albert Einstein in 1905. HS-PS2-4. Use mathematical representations of Newton’s law of gravitation and Coulomb’s law to both qualitatively and quantitatively describe and predict the effects of gravitational and electrostatic forces between objects. HS-PS3-5. 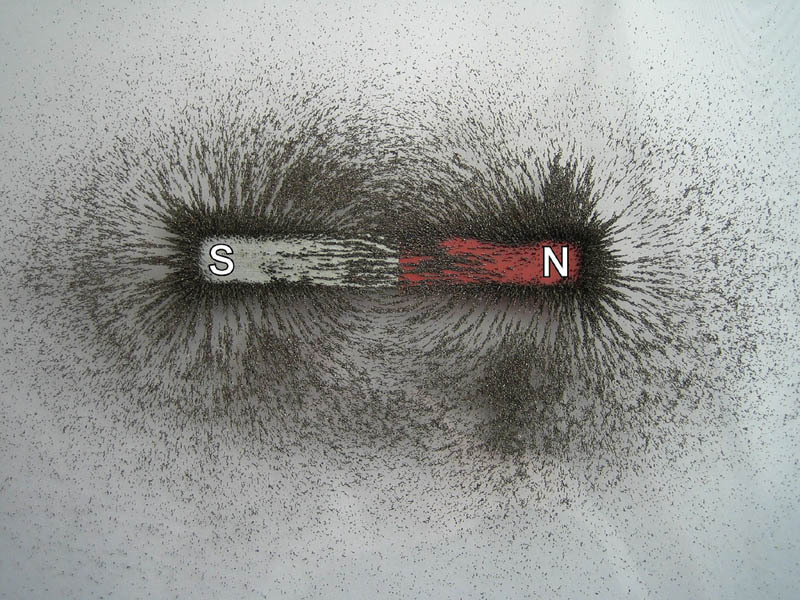 Develop and use a model of magnetic or electric fields to illustrate the forces and changes in energy between two magnetically or electrically charged objects changing relative position in a magnetic or electric field, respectively. CCSS.Math.Content.7.RP.A.3 ( Grade 7 ): Use proportional relationships to solve multistep ratio and percent problems.